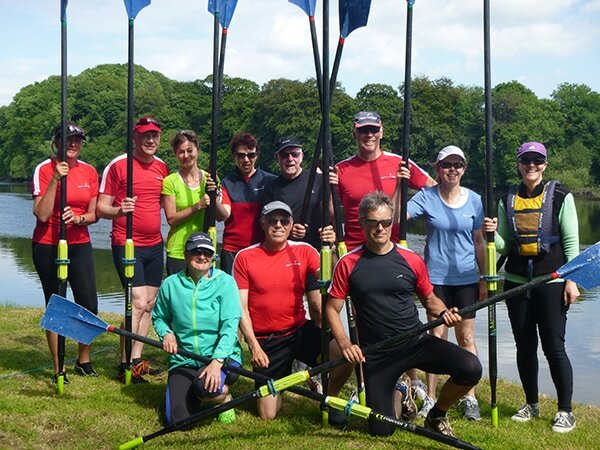 Explore the sunny southeast with a wonderful Irish rowing adventure. This delightful corner offers everything that Ireland is famous for, and then some. Charming cities, towns and villages are filled to the brim with friendly people, dramatic history and vibrant culture. Verdant hills clothed in forests, pastures and farmland are wound round by beautiful rivers. The coast is never far away, with striking scenery of beaches and cliffs. Towns and cities have a long fishing and shipping heritage. Historically the rivers were integral to the maritime transportation system, bringing goods down to the ports and ferrying merchandise back inland. In fact, the tidal pull is felt well inland. 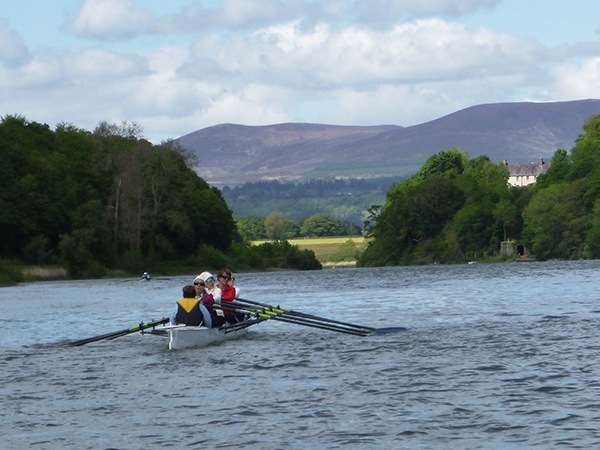 Feel the pull of the southeast and enjoy the best of rowing and travelling in Ireland. Counties Kilkenny, Carlow, Wicklow and Waterford. Rivers Barrow, Nore, Liffey and Blackwater. This is heaven – having four exceptional rowing rivers in close proximity, and having four of the loveliest counties in Ireland to explore. 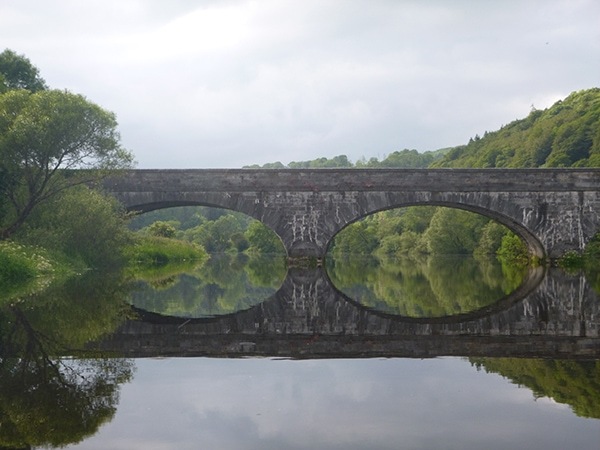 River Barrow is one of Waterways Ireland’s navigable rivers, and is a delightful twisting river touching the borders of three counties. The Nore is the little sister to the Barrow, an intimate rowing experience. The Liffey packs a lot of history in Co. Wicklow as it starts at Blessington Lakes as it flows down to the sea in Dublin. Evocatively named River Blackwater is firmly in Co. Waterford, offering big vistas with heather clad mountains in the background. Which will be your favourite? The cuisine of southeast Ireland has gained a strong reputation, combining seafood with the bounty of the inland farms. No doubt you have heard of cheddar from Co. Wexford but what about Triskel cheese from Co. Waterford? (Hint – it is a goat cheese). Along with good food comes a rich history in this region told through several exceptional exhibits such as the Famine Ship in New Ross. Then there is the culture that is both modern and traditional. Case in point: according to Lonely Planet: “County Kilkenny’s namesake city is the urban star with a castle, cathedral, medieval lanes, cracking pubs and hip eateries, making it one of Ireland’s top destinations.” Good food and rich culture are also part of this wonderful Irish rowing adventure. This May trip is extra special, since it will be a women’s only trip. What better place to travel with a few of your favourite female friends, and to make new ones! Perfect for solo female travel! This is our second women only trip, read about how we started this lovely tradition in Italy. Guide services and tour support. Trip guided by Brian Roberts. Private departure dates available – please contact us for details. You could potentially connect with our Cork + Carbery Islands tour for more Ireland! Note that most of these rivers are tidal in nature and the influence of these tides is significant. The tides on the selected tour date will determine the exact time of the rows, and this will influence the sequence in which activities will happen, and even the direction the rowing will occur in. Wind conditions will also be an important consideration – safety is a priority. Thus, on some days, the actual program may vary from this description. Arrive in Graiguenamanagh. Transportation will be provided from Kilkenny. Stretch your legs from the travel with a walk or cycle along the Barrow tow path. Settle into the Waterside Guesthouse, which will be our base for the next few days of adventure. Recognized in the Michelin guide to Ireland, the restaurant will serve up a wonderful welcome dinner. The rowing begins. 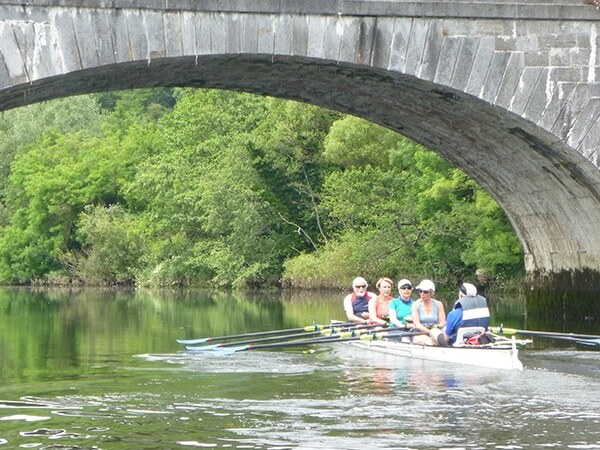 We leave Graiguenamanagh to begin rowing with the current. To the first lock at St. Mullins, the winding river is lined with the tow path on one side. We’ll get our rhythm as the river flows among low hills, reedy shores and oak forests. After a lovely picnic lunch, the nature of the river changes, as hills dip straight down into the water with no traces of towpath or humans – just wild woods. Eventually the water widens out, and we arrive in New Ross, leaving the shells at the local rowing club. New Ross is famous for the Dunbrody Famine Ship. A replica of the “coffin ships”, the Dunbrody animates the huge emigration to America and Canada during the famine years in the second half of the 1800’s. Transport back to Graiguenamanagh. This evening, if we are lucky, some traditional music might be waiting for us in the local pubs – one of which is in a hardware store. We travel back to New Ross, from where we briefly row up the Barrow, before turning into the delightful River Nore. 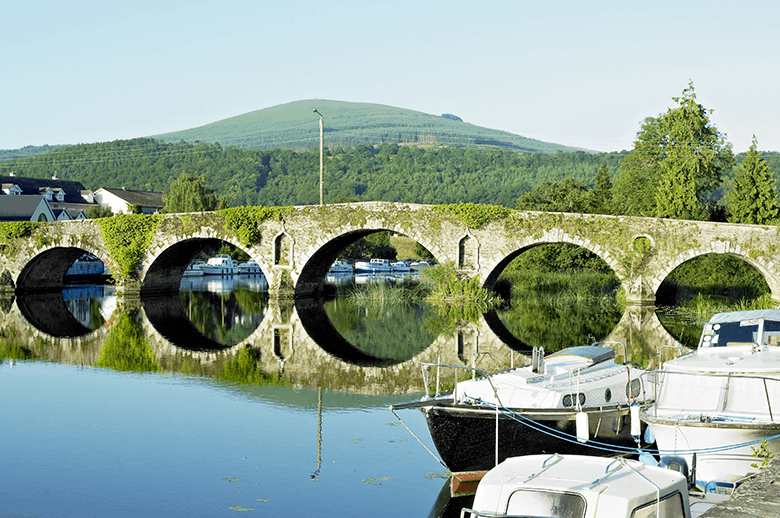 Our destination is charming Inistioge. The village is so picture perfect that it has been the scene for several movies. 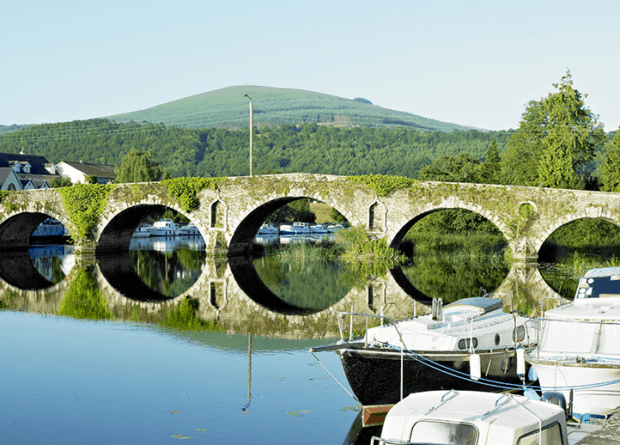 There is the option to walk over Brandon Hill and back to Graiguenamanagh. Or get a ride back and spend more time exploring Graiguenamanagh, especially Duisike Abbey and the woollen mill and crystal studio. Kilkenny is calling. Today is a rest day from rowing, but we will be busy exploring the delightful city of Kilkenny. Dominated by its castle rising above the River Nore, the city is a warren of twisty streets lined with brightly painted houses and shops. The cathedral merits a visit. We start the morning with a cycling tour of the city to see the highlights. The afternoon is unstructured, giving you time to wander the streets, laze along the banks of the river, shop for crafts and generally soak up the vibe. Back to Graiguenamanagh. Another day, another county, another river. We have several choices, with the weather and tides determining our destination. Likely we will head north to Co. Wicklow. Framed by the county’s namesake mountain, Blessington Lake is a reservoir created by the damming of the River Liffey. There are several arms, and we will choose our route and length of the row based on water conditions that day. Or perhaps we will explore a different section of the Barrow upstream. Alternately we could row the River Suir in Co. Waterford, which flows to Waterford where we will be based for the next two nights. On to the River Blackwater. The tide will determine if we row upriver or downriver. Near the sea at Youghal the river is broad and bordered by low green hills. By Cappoquin it has narrowed, with the Knockmealdown Mountains forming a backdrop. 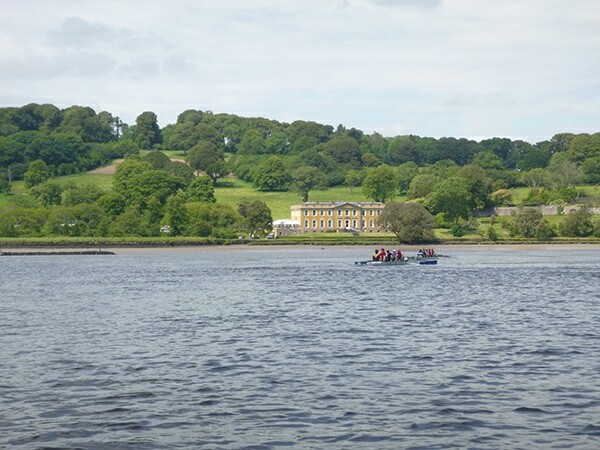 We will row past Ballynatray Estate, a fine example of an 18th century country castle house. Other castles, Georgian mansions and ruined abbeys dot the landscape along the river. On the way to Waterford we may detour to visit the gardens of the stunning Lismore castle. However, we will be sure to save some time to discover Waterford, a blend of Viking, Norman and Georgian history and architecture and also famous for its crystal. Time for our farewell dinner. Enjoy a little more time in Waterford before leaving. But before you go, we will need to know which is your favourite river.